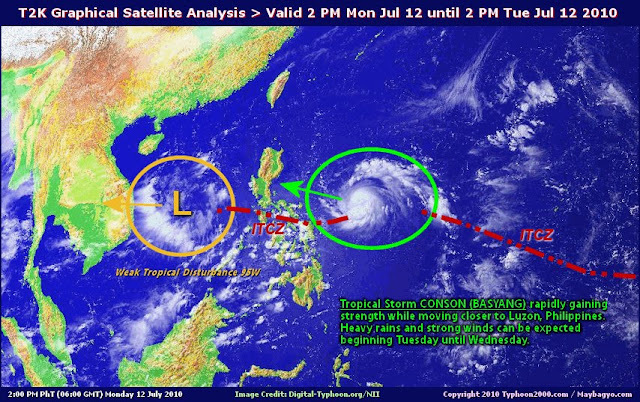 That would be Tropical System 03W, internationally named “Conson” and – because PAGASA likes to give funny little Pinoy nicknames – locally called “Basyang.” From its name alone, we can infer that it was the third significant tropical disturbance to develop in the Western Pacific. I got up from the bed; reached for the light switch; discovered there was no electricity; and went to pee in the dark. Mentally, I was clucking my tongue. Tsk! Batelec! Kahinâ naman eh! Frankly, I did not think the disturbance was all that frightening. The winds would blow menacingly as they rather tend to do when there are storms – but then the whistling would quickly die down. So, after taking a pee and then hastily gulping down a tumbler of water I bring to my room each night, I did the most obvious thing in the world to do – I went back to sleep. I had been keeping an eye since Monday on Basyang through several weather web sites I regularly monitor. 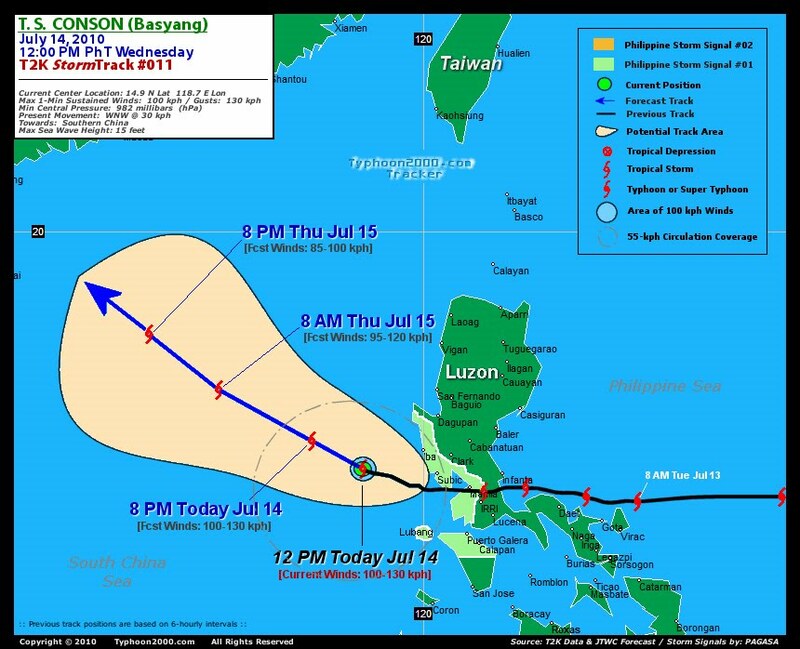 As late as midday yesterday, 5 of the 6 tracks – including our very own PAGASA – predicted Basyang would make landfall somewhere over Quezon and then head on towards Central Luzon. Early yesterday morning, I even IM-ed a nephew who now lives in Baguio to warn him of the approaching storm. Batangas was not even among the list of provinces placed under Signal Number 1. By midday, it was inserted almost as an afterthought. For those who do not know, PAGASA – in its web site – makes available to those interested a weather satellite picture of the country every hour on the hour. I click on the thumbnail every hour whenever there is a significant tropical system tracking close to where we are. Although – as mentioned earlier – most of the tracks showed the system heading north and just missing us, I was getting fidgety looking at the hourly satellite pictures yesterday afternoon. 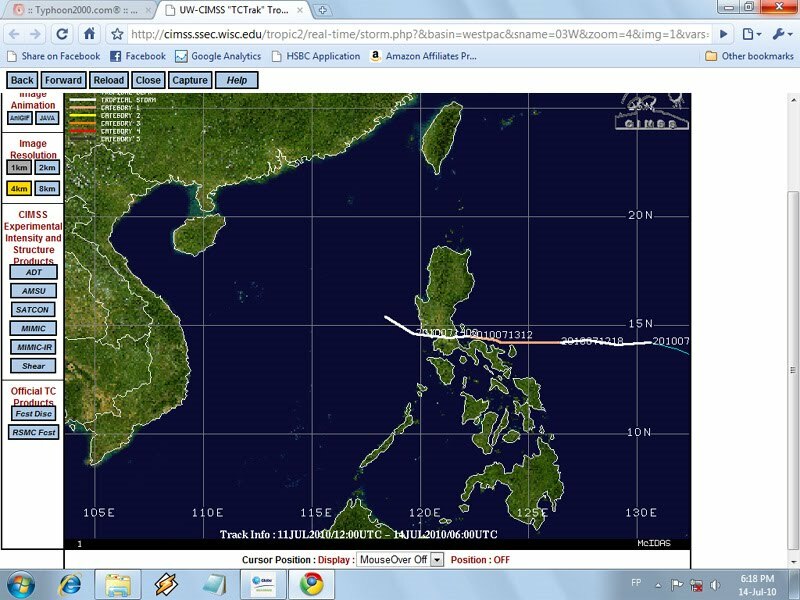 The hourly updates showed the big blob tracking due west to where Southern Tagalog was! Before leaving my office, I took another peek at Typhoon2000.ph – the other site I check for updates – and both the US Navy and the Japan Weather Bureau – who are fairly reliable in their predictions – had not changed their predicted tracks. There was this one track, though – by the University of Wisconsin – that showed the system tracking due west. Significantly, before I left the office, I noticed that PAGASA’s hourly picture showed the blob breaking up somewhat as its outer bands hit the country’s eastern shores. That was a cause for optimism because storm systems rather tend to break up and lose intensity over land. I continued to check PAGASA every hour here at home before I went to sleep, and there were no significant changes either to Basyang’s track or its intensity. I was fairly certain, therefore, that there was no real cause for alarm. Early this morning – as they rather tend to do when there are weather disturbances – text messages roused me from my sleep asking if we had classes. Until last school year, I was the school’s unofficial PAGASA weather substation. This year, though – having been re-assigned to another office – I am not at all the person to ask if there will be classes for the day. I did learn from a colleague after I got up that classes in the Integrated School had been called off. That, in itself, was a surprise. I thought Basyang had been fairly innocuous for classes to be cancelled. 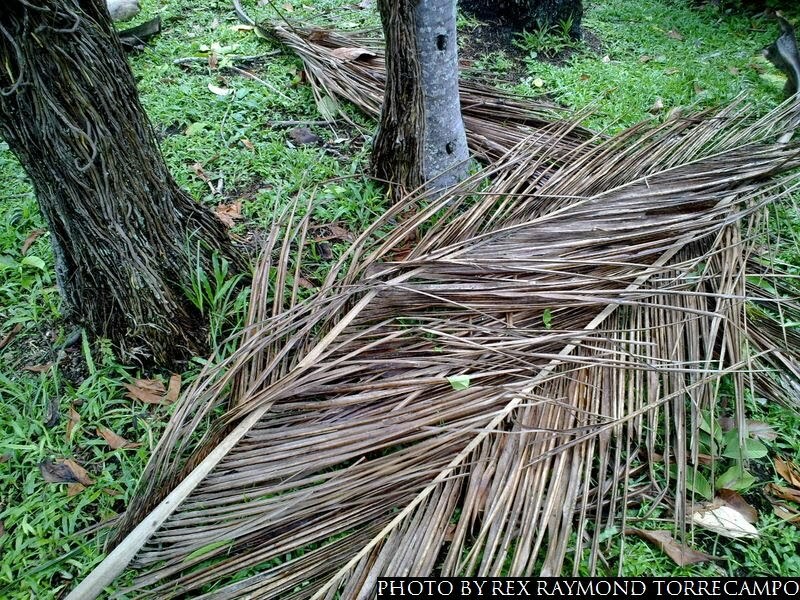 When I left the house for work, the driveway was – as always, after a storm – littered with leaves, twigs and palapâ ng niyog. I still thought nothing of the mess because palapâ tends to fall off the coconut trees with any sort of wind. 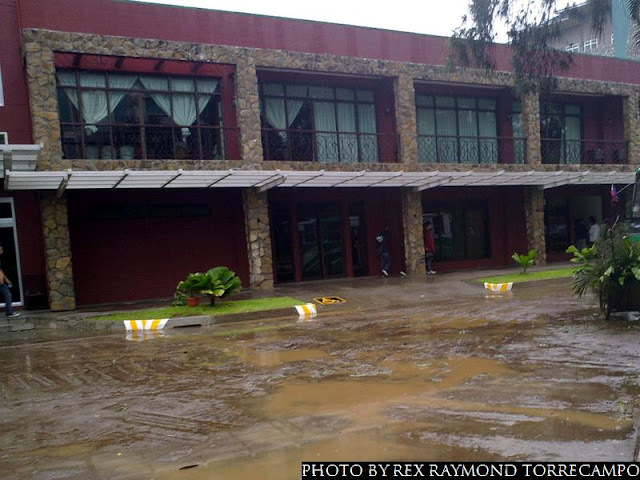 In school, but for the mud on the campus roads, there was nothing extraordinary. I had seen worse! “Ah, gan’on?” I replied, surprised. I found the eggplant story amusing, although I still had not quite grasped the real situation. Fortunately, the gen-set was on – and our server systems were functioning. PAGASA was out, for crying out loud! Dear Noynoy… Please allocate some funds for PAGASA to acquire new servers. Kindly make sure they also have enough left over to buy UPS batteries. From people I talked to within the course of the morning, I learned that the winds started to howl eleven-ish and continued to do so until the wee hours. Basyang passing through had been – as a matter of fact – quite significant. By midday, the sun was starting to come out for a look-see. Basyang is now being referred to in the past tense. I will remember it, though, as this one storm that stole through the night without my even knowing it had been right at my doorstep.